Fiji opened their defence of the Pacific Nations Cup with a bonus-point victory over Tonga in Lautoka. Watisoni Votu and Sireli Bobo, who missed the warm-up match against Italy last week, both scored twice while Nemani Nadolo and captain Akapusi Qera also each registered a try. 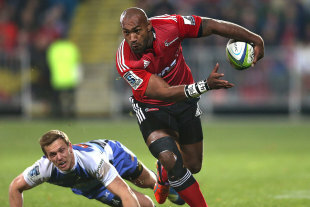 Nadolo contributed 20 points with his try, six conversions and a penalty. Nadolo had Fiji on the board within three minutes of the start, with a penalty, and they raced to a 24-3 lead at half-time. Tonga, who opened their campaign with an 18-18 draw with Samoa last week, relied on a penalty by Fangatapu Apikotoa for their first-half points. And they failed to score again until the final 20 minutes, when they trailed 30-3 and Fiji were down to 14 men after Votu had been yellow-carded. They capitalised on the one-man advantage with two quick tries by replacement forward Viliami Fihaki, converted by Latiume Fosita. Fiji, back to full strength, shut out the game with further tries from Bobo and Qera.